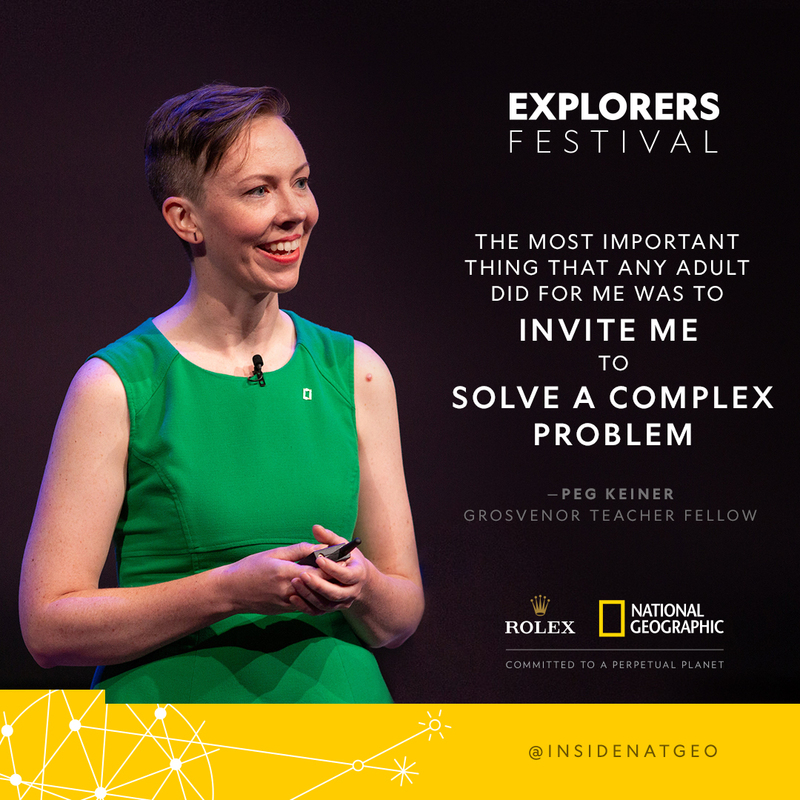 Peg Keiner was one of the educators who joined us at the 2018 Explorers Festival. As a technology and innovation leader, she has had the opportunity to bring unique ways of learning and exploring to her community. Through the Grosvenor Teacher Fellow Program, she was able to share her journey to Antarctica with her school community. Peg sat down with us to talk about all things science, technology, and exploration. Tell us a little bit about yourself, your background in education, and what makes you passionate about your work. I am the director of innovation at GEMS World Academy Chicago, and I got involved with National Geographic and Google Earth at a hackathon about two years ago. My passion for schools is to use technology as a raw material to uncover hidden systems, and that’s what I’ll be talking about this week during Explorers Festival! There is a constant debate going on about whether technology is helping or hurting the way students learn; tell us about why you think technology is necessary in the classroom. We have an opportunity to use technology as a way to uncover the hidden systems in the world all around us. In this way, we also use it to empower students. Whether it’s students collecting data or explorers collecting data, we can use the collected data as a way of seeing things that are happening that we normally could not just observe. How did your experience in Antarctica as a Grosvenor Teacher Fellow contribute to your work? How did you incorporate what you learned into your leadership roles? I was able to pull my Antartica experience into several different grade levels. My school was very personally invested in the journey before I left. In kindergarten, they studied a journeys unit, and were with me for up to nine months prior to my expedition. They helped me plan my journey and even asked me a lot of personal questions to see how ready I was for this journey. They asked things like: Are you excited? Are you scared? Are you nervous? I did storytelling in kindergarten and told them what I found on my journey as a follow-up to the original unit that they did. I also saw them again while they were studying waste, and we talked about how to keep Antarctica a pristine place. In first grade, we studied families. I shared all the footage that I gathered about how Antarctic animal families collaborate, communicate, and take care of each other. In second grade, we did survival. This is the most exciting lesson; we were able to use a lot of new tools from Google. I created a 360° tour for students to investigate the landscape based on how harsh the obstacles are. I did multiple presentations to the whole school to gather questions. Those questions drove the tools that I brought on the journey. Then, when I came back, my presentations were very targeted based on the units students were studying. The students themselves created migration stories where they chose animals, found and researched all the obstacles that they faced, and then coded the journeys that those animals take from place to place. So I share the tools with them, but they’re able to take it to a whole other level. Is there anything that you’ve heard so far at Explorers Festival that you’re particularly excited about? What we don’t see, and what future explorers know, is all the executive functions and all the planning that is involved before you go on a journey. The stories that we see in National Geographic and social media are not really showing all the hardships and grit that it takes to be an explorer. Those are the stories that educators are gathering here; we’re learning about the entire process and that’s been really exciting. They’ve given some great advice. I thought I’d have to find new tools, but they taught me this week how to fix the tools I already have, and how to be really resourceful in the field. That’s not something we always see in the media. I’ve already connected with an explorer this week, we shared media, and I now have a new tool to bring back to the classroom! That we’re about to make these connections and create projects right away has been super-exciting and unexpected. In the next five years, how do you think technology will change the landscape of education? The future of what companies are creating for classrooms to use is about uncovering systems. When you see things like augmented reality coming in, those pieces are allowing us to engage with phenomena that are (usually) so hard to share with students. I think there’s going to be a deeper emphasis on how we use those tools in the classroom in a way that physically explains things. Personally, what I’m seeking from technologists is citizen science tools for students at a younger grade level. Many of the current ones are for ages 12 and up, but if we really want to create transformative people, we need to start as early as possible. As far as the technology regimen that people are in, I would love some kind of citizen-science awareness or app to be a part of that daily routine. Those are some hopes and dreams! I feel like at times the future of technology is also going into a geospatial landscape. Lots of new geospatial tools like Google Earth and Google Voyager Stories are coming out. It’s very exciting to see that path. What’s your advice to other educators on how to encourage students to see themselves as explorers? To make exploration more accessible, I think you need to just break it down into parts in thinking about the parts of your journey. At the end of the day, these large journeys that are showcased are just a person going to a place, to find out something new. If we can condense exploration into smaller journeys and see it as simply going to a place to collect data and learning something new from that data, then we can find ourselves in a better place. I feel like people believe that exploration is just too big or not accessible and I hope that—especially through National Geographic Education—we can start to break down those walls.